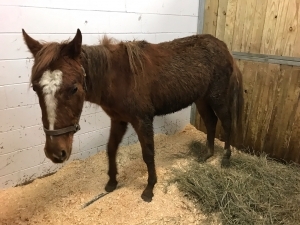 Epona came to MHARF from a late March 2019 Fillmore County humane case. She was foaled in approximately 2017. Epona is a nice young mare who is currently working on gaining some much needed weight before she will be ready for adoption. Watch for updates! You can read more about this humane case by following the links to media coverage on our Home Page.